Echinacea ("eck-in-ay-sha") is an herbal remedy that may help the body defend itself from the viruses that cause colds, sore throats and the flu. 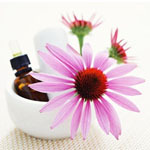 Herbalists consider Echinacea one of the best blood purifiers and an effective antibiotic. Echinacea aids in the production of interferon has increases antiviral activity against, influenza (flu), herpes, an inflammation of the skin and mouth. It may reduce the severity of symptoms such as runny nose and sore throat and reduce the duration of illness. Echinacea's antibacterial properties can stimulate wound healing and are of benefit to skin conditions such as burns, insect bites, ulcers, psoriasis, acne and eczema. It's anti-inflammatory properties may relieve arthritis and lymphatic swelling.It has also been used in homeopathy treatments for chronic fatigue syndrome, indigestion, gastroenteritis, and weight loss. Medicinal use of this herb began with Native Americans, who used E. angustifolia to treat health problems ranging from respiratory infections to snakebites. During the 19th century, echinacea was used as a blood purifier and a treatment for dizziness. Since the early 1900's hundreds of scientific articles have been written about echinacea. Most of the research during the past 10 years has focused on the immunostimulant properties of the plant. In the early 20th century, it was used as a cold and flu remedy, and as an anti-infective until the advent of modern antibiotics. Its recent resurgence as a treatment for upper respiratory infections (URIs) has placed echinacea among the three top-selling herbs in the United States. Resembling a black-eyed Susan, Echinacea (or purple coneflower) is a North American perennial that is indigenous to the central plains where it grows on road banks, prairies, fields and in dry, open woods. It is also called snake root because it grows from a thick black root that Indians used to treat snake bites. The Plains Indians used various species of echinacea to treat poisonous insect and snake bites, toothaches, sore throat, wounds, as well as mumps, smallpox, and measles. The settlers quickly adopted the therapeutic use of the plant. It has been shown in animal and human studies to improve the migration of white blood cells to attack foreign microorganisms and toxins in the bloodstream. Research suggests that echinacea's activity in the blood may have value in the defense of tumor cells. Echinacea properties may offer benefit for nearly all infectious conditions. Studies show echinacea prevents the formation of an enzyme which destroys a natural barrier between healthy tissue and damaging organisms. The herb is a mild antibiotic that is effective against staph and strep infections. Echinacea facilitates wound healing, lessens symptoms of and speeds recovery from viruses. It may also increase resistance to candida, bronchitis, and other infectious conditions.